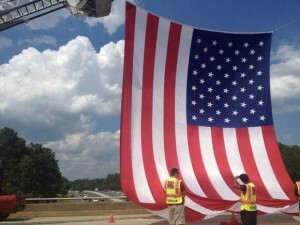 A neat story out of Fort Mill, SC where the local fire departments hung a 30×50′ American Flag above I-77 to welcome home a bus of DDAy? Veterans who were returning from last week’s 70th Anniversary events in France. It’s #NationalFlagWeek leading up to #FlagDay2014 this Saturday, June 14th. Are you ready? We are! Make sure you have Old Glory flying high this week and especially on Saturday. A very interesting article by Jada Smith from the NY Times highlights the work being done by Iraq and Afghanistan Veterans of America as they try and raise awareness of issues regarding Veteran Suicides. They recently lined nearly 2,000 American Flags on the National Mall to raise awareness of their cause. 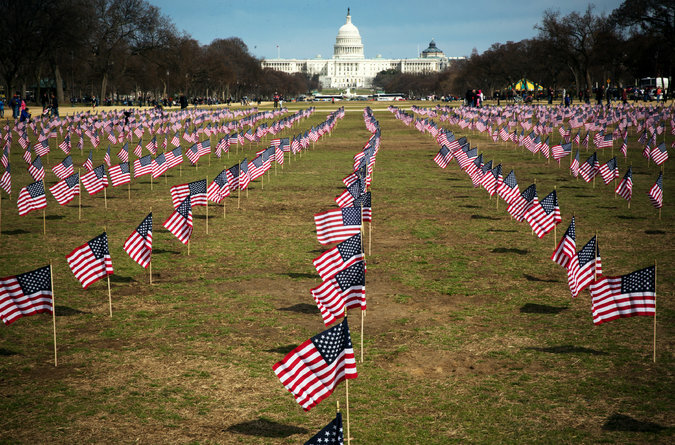 The 2,000 flag represented the amount of Veteran Suicides thus far in 2014 alone (approximately 22 per day). WASHINGTON — Volunteers in dark green hooded sweatshirts spread out across the National Mall on Thursday, planting 1,892 small American flags in the grass between the Washington Monument and the Capitol. Each flag represented a veteran who had committed suicide since Jan. 1, a figure that amounts to 22 deaths each day. Civilians stood among the waving flags in solidarity with veterans like Michael Blazer, a former sergeant in the Army who had a friend commit suicide when he got back from Afghanistan. The event was part of an awareness campaign mounted by members of Iraq and Afghanistan Veterans of America, an advocacy group focused on issues affecting the nation’s newest veterans. They are in Washington this week as part of their leadership development program, Storm the Hill, and to support the introduction of legislation aimed at preventing suicides and providing more mental health resources for service members home from combat. Event organizers said that the issues were a top priority for veterans and their families, and that they wanted to make them a priority for Congress, too. Senator John Walsh, Democrat of Montana and the first Iraq war veteran to serve in the Senate, introduced the Suicide Prevention for America’s Veterans Act on Thursday. For Mr. Walsh, the issue is personal: A sergeant who served under him when he commanded an infantry battalion in Iraq in 2004 and 2005 committed suicide after returning home. When service members leave the military, they can get five years of no-questions-asked care from Department of Veterans Affairs hospitals and facilities. One of the bill’s main goals is to extend that window to 15 years. The bill also calls for the military to set up a review process for troops who are discharged for behavior that could have been caused by mental health issues. Measures to help the Veterans Affairs agency recruit more psychiatrists are also included. The striking display of red, white and blue caught the eye of almost everyone leaving a Metro station on the Mall on Thursday. One man wearing a hat with “Vietnam Veteran” stitched on the front took pictures. Others stopped to ask what was going on. Roger Engetschwiler and his daughter, Katja, were visiting from Switzerland. They were headed to the Holocaust Memorial Museum and then the Lincoln Memorial when they paused to find out about the flags. Knowing and practicing proper American Flag etiquette can save you and your company/agency a lot of grief down the line. Most examples of poor flag etiquette are accidents but they can still lead to PR nightmares for companies. See how this SC government department is paying the price for a flag mishap. 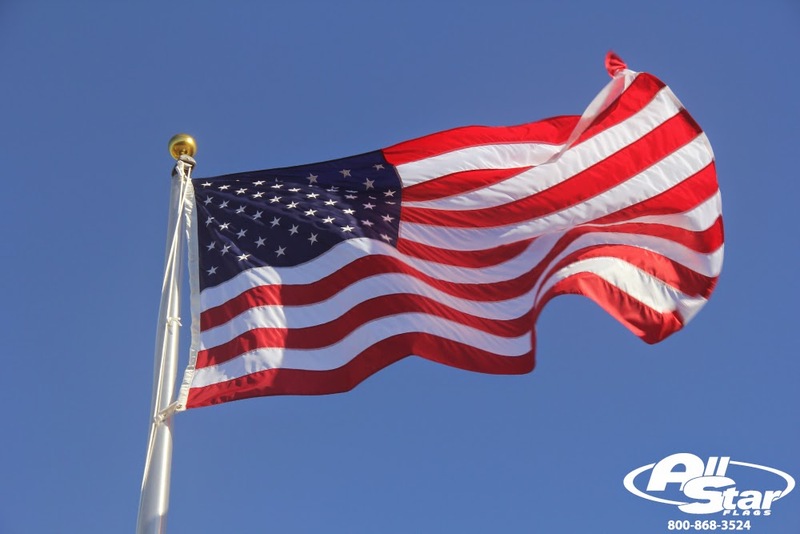 Make sure to always check that the American Flags you purchase are Made In The USA like the ones we offer here at All Star Flags. A great piece of legislation written by Congressman Mike Thompson was just passed that requires American Flags purchased by the Dept. of Defense to be Made in America. All Star Flags shares an instructional video on ways to properly care for your American Flags that was produced by Annin Flagmakers. 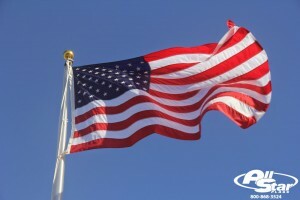 Keeping your flag out of inclement weather will certainly add life to the flag. 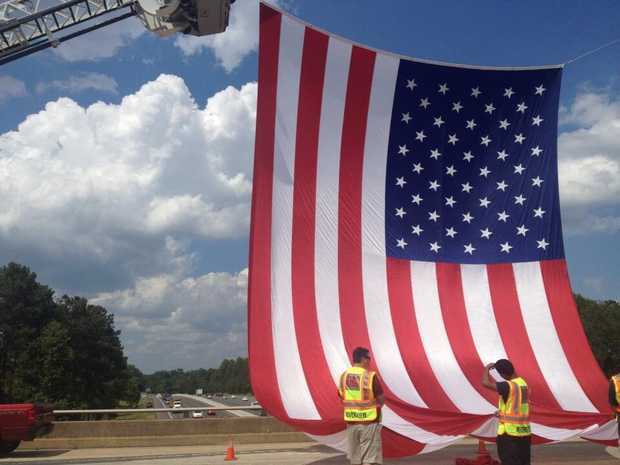 Take a look at this large American Flag that was exposed to sleet and freezing rain. The ice/moisture froze onto the flag fabric and made the flag brittle which caused it to rip and tatter in a matter of 4-6 hours. This was from the ice storm this week here in Wilmington, NC. Visit our Flag Facts page to see our newest article about The History Behind Nautical Flags. Visit our Flag Facts page to see our newest article about some of the Previous Designs of the American Flag. The people at www.10best.com (A division of USA Today), recently posted one of their surveys on the best State Flag Designs. 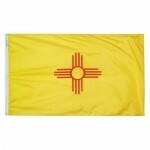 Those that read the article and voted in the survey selected New Mexico as the best designed state flag. New Mexico was followed in the voting by: Colorado, Texas, California, New Hampshire, Arizona, Ohio, Alaska, Michigan and Kansas. Did your state make the list? The designs of many state flags are deep in traditions. 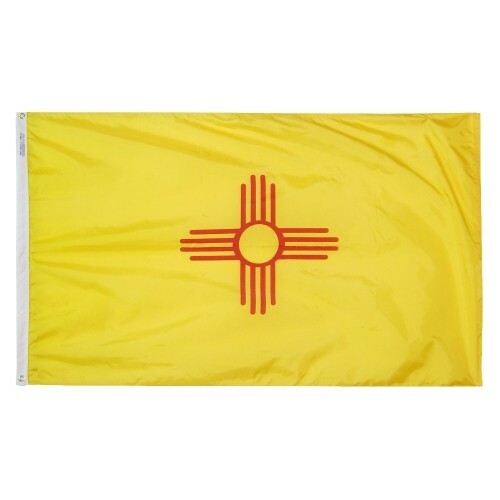 Some flags feature state seals and motto’s while others feature symbols or particular color combinations. Ohio boast the only state flag that is not rectangular in shape and this could be what landed them on the 10 Best list. The Texas flag has long been a favorite of many people. All Star Flags was surprised to see Kansas, Michigan and New Hampshire on the list as these designs are some of the more typical for state flags. We were surprised that Hawaii, Oregon, Washington, Tennessee and South Carolina weren’t on the list. These flags are usually viewed as extremely popular designs.